13 Best quivers for hunting 2019 : Back & Hip quiver revealed by Experts! Finding the best quivers for hunting means that you need to imagine how each type might fit your own personal preference until you find the style and brand that works for you. You may think that you don’t need a good bow quiver. You hear the word bow quivers, and immediately you get this idea in your mind of Robin Hood with a big round cylinder on his back holding his arrows, as you are here you know it is one of the most important among archery accessories is for hunting, it doesn’t matter whether you go with back quiver or hip quiver but it surely enhances yours shooting experience. This couldn’t be further from the truth. It doesn’t matter if you are shooting with recurve bows or compound bows, No matter if you are hunting in a tree stand or walking through the woods, an arrow quiver will help you to be ready to go when your target is in sight. 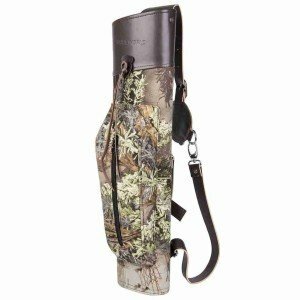 What should you consider for buying hunting quiver? The key in how I went about selecting these top products is to provide a nice variety of the top quivers on the market. Personal hunting styles must be taken into account when finding the right quiver, and this gives an excellent variety of choices. These are all highly-ranked best quivers for hunting from quality companies that provide durable and high-quality workmanship. Highlights of the Bear Archery Logo Deluxe Back Quiver are the accessory compartment, 22-inch depth to the quiver, compartments for the arrows, and the adjustable harness. 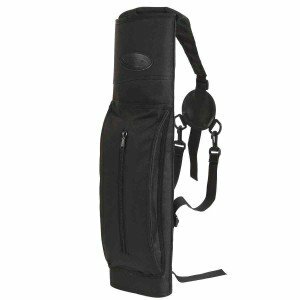 This back quiver offers a lot of the benefits that the traditional quivers do not have, such as a zippered compartment for other equipment storage and the divided compartments inside the quiver itself to allow for arrow separation. This is great if you have more than one size arrow you like to carry. The durable leather construction is meant to last for hunting season after hunting season which makes it best back quiver for hunting. 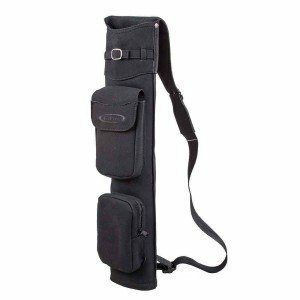 The three-point harness makes this a comfortable quiver to carry, and it works well for both right and left handed shooters. You can fit about 20 to 30 arrows in this quiver. A secure fit means that you will be able to travel without worrying over any rattle sounds and dislodged arrows. the adjustable shoulder strap, belt clip, and easy to use design. This traditional quiver does not have any tubes inside of the quiver. Also, the adjustable strap makes this a good choice to use for back or hip shooting styles. There are two straps making this very secure no matter your movements during your hunting trip. This quiver will hold about 24 to 30 arrows. It will work well for both left handed and right-handed shooters. It offers quality hand construction that may need to have some inserts added if you are looking for something with a more rigid construction. The suede material it is made out of is a very durable material that will hold up well over time. This can be a good choice for children and woman because of the size and adjustable strap. Highlights of the G4Free Archery Deluxe Canvas Back Arrow Quiver Hunting Target Arrow Quiver are the heavy-duty canvas material, it’s lightweight, easy to use, has a foam insert for broadheads, and is comfortable to wear with the three point harness. This back quiver can fit about 24 to 30 arrows inside of it. Quiver length is 21.7 inches, and will accommodate most arrow sizes which makes it best arrow quiver for hunting. This states that this is for right handed people, but reviewers have noted that they use it with their left hand, as well. The straps are adjustable, so this will fit on a wide range of body types and sizes while providing a nice secure fit. Since this is canvas, you may find that you want to add some inserts to make it stiffer, but that is a personal preference. The canvas itself should wear well over time considering this is the preferred material for sails and rugged materials. Highlights of the Hikingworld 21inch High-grade Arrow-back include strong fabric that is a natural sound dampener, a large pocket to store arrows, and easy to use for both left handed and right handed shooters. This quiver can fit about 24 arrows in it, and its length is about 21-inches. 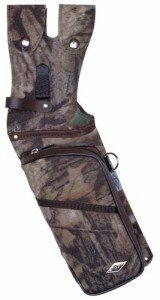 This is easy to use quiver that has adjustable straps to make it easy for any sized hunter to enjoy. The velcro strap inside the quiver is an excellent addition that helps to keep everything in place as you are hunting. It is best to use this when traveling rather than when actively hunting as it may make it too difficult to draw your arrow in a quick and quiet fashion to shoot your target even people are in love to use it in target archery . The microfiber leather material that it is made out of will last nicely through the years, and it gives this quiver a nice look. Highlights of the Hikingworld 21″ Waterproof Real Leather Archery Arrow Quiver are the quality cowhide and cobra leather material, accommodates right and left-handed shooters, adjustable straps, and a length of 21-inches. This is truly a statement piece with the exotic look and feel of the leathers used in it, but it also is very useable. The leathers used are not only durable but are also waterproof. The hardware fasteners are heavy-duty and will stand up to quite a beating. This quiver will work with arrows that are about 25 to 30 inches long. 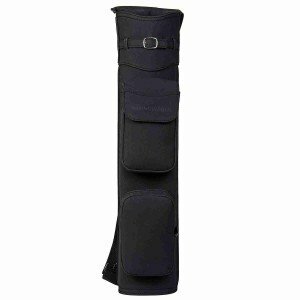 This back quiver is perfect for hunting or showing off when target shooting. It is very versatile and best target quiver. You will be hearing about this quiver for quite some time with how unique and different it is. Highlights of the G4Free High-grade Matte Velvet Arrow-back pot Quiver are that the microfiber materials make it comfortable and lightweight to carry, and has a very deep compartment. This back quiver can hold 30 arrows. 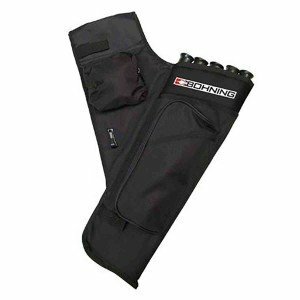 This offers pockets to help with keeping your small bow hunting materials stored. The microfabric material also helps with keeping this bag quiet as you hunt. This quiver works well for right handed shooters as it is a fixed back it will not be a good fit for someone that uses their left hand to shoot. There is nothing in the bottom of this quiver to provide protection for broadhead arrows, so it can be a good idea to either use the long pocket to store them or for you to put a cloth or foam into the bottom to protect it from rips. 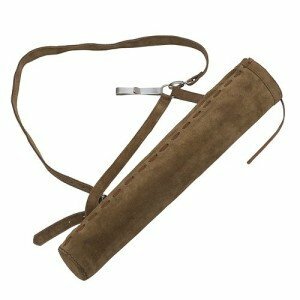 Highlights of the Hikingworld High-grade Matte Velvet Arrow-back pot quiver are that it is made of a quality velvet, is 21-inches in length, and is easy to use. This is strictly for right handed shooters as it has a fixed harness to go over the shoulder. These fixed straps are adjustable for right handed shooters of different sizes. This back quiver can accommodate about 24 arrows in it. Arrow lengths to use with this quiver are about 25 to 30 inches long. Since the velvet is matte velvet, it will clean up nicely while still showing off the look of high-quality materials. This durable quiver will be an excellent addition to your hunting gear as you can’t go wrong with how sturdy it has been made. Highlights of the Bohning Adult Right Hand Target Quiver are that it is durable, has a place for everything, and offers a lot of storage. The quiver itself has five tubes inside of it for storing arrows. It also offers two pockets on the exterior that are zippered for holding your hunting odds and ends along with having a sleeve pocket. This quiver is 19-inches long, and can hold about three arrows per tube for about 15 arrows in total. The tubes are removable. This may not be the best arhery quiver if you use broadheads as the tubes are only about an inch in diameter, so they may get stuck as you try to retrieve them out. 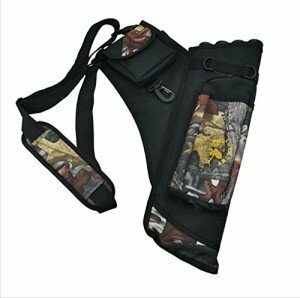 This hunting hip quiver will slide onto your belt for easy access. It is made out of durable nylon, so it will work well in all sorts of weather. Finally, because of the design, this is strictly for right handed shooters. 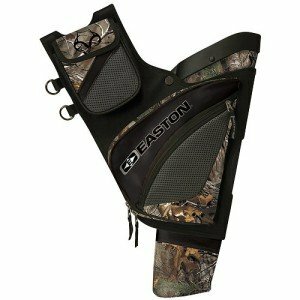 Highlights of the Easton QH100 Hip Quiver are it’s made out of sturdy material with a molded body and offers additional storage. This hip quiver has a lot to offer a user in that it is not like some of other field quivers that are rather flexible. It attaches to your body using a belt or D-ring. This has a molded foam body that will hold arrows tightly. There are separate arrow compartments in the quiver. The nylon material makes this a quiver that you know will last for years to come. There are also zippered pockets for storing other items along with a pocket on the top that is secured with a magnetic closure. There is also a bow square slot. This quiver is great for both left and right-handed shooters to use. It can hold about a dozen arrows. Highlights of the Archery Bow Arrow Shoulder and Hip Quiver include several tubes inside the quiver, lightweight design, padded strap, and storage. This shoulder or hip quiver works well for right handed shooters. The padded strap makes it nice to wear for longer periods of time, and the multiple pockets available are great for storing all of your small hunting gear items. You can either fit one broadhead arrow per tube or a few other arrows per tube. These tubes are great for easy access when it comes time to draw the next one out of the quiver. The camo fabric on this quiver adds a perfect touch when hunting as it will help it to blend in with the rest of your gear. 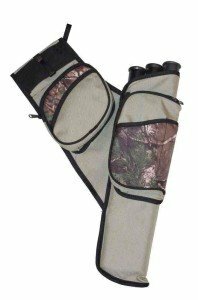 Highlights of the Neet N-495 Quiver Realtree All Purpose Right Hand include multiple places to store items and a trim design that will work well on your hip. This hip quiver offers snaps that will attach it securely to your belt. There are eight zippered pockets on this quiver. Since it can hold a pencil and scorecard, it may seem that this is only right for target shooting on a range, but you can certainly take it hunting with you as it is rugged enough to hold up in the woods. The durable materials that this is made from will keep it looking just as it did when you first purchased it. This will fit about three to four broad-headed arrows in it. Due to the design, this is for right-handed shooters. You can fit about 24 arrows in the quiver with about six in each tube. If you are using broad-headed arrows, you will probably only be able to put about one arrow per tube. 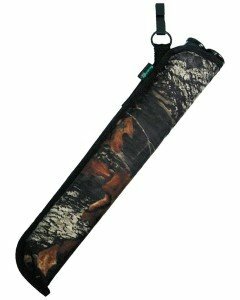 The canvas and plastic material that this quiver is made of will go well with your other hunting gear with the camo accents. It can be secured to your hip using either the belt clip or on your belt through a sewn area on the quiver. The belt loop will help to keep it secure to your hip as you travel. 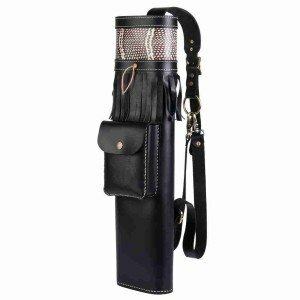 Tarantula 2 tube quiver includes a two tube quiver that works well for both left and right handed shooters. This hip quiver is 17-inches long and has a belt clip included for securing it to your hip. The tubes can be removed, but are stapled together. They are made of sturdy material and can take a beating. This quiver can hold about eight arrows in a tube for a total of 16 arrows. This may not be useful for broadhead arrows unless you add some foam or cloth to the bottom to help with ripping. The manufacturer stands behind their products and offers a lifetime warranty where they will replace or fix your quiver if something happens to it. This sized quiver works well for children and some women. The camo pattern on the quiver is a nice touch. Some of the things that you need to consider when contemplating which bow quiver will work the best for you is your personal hunting style. What prey do you usually hunt for? What type of bow will you be using? How many arrows do you want it to carry? Will you be carrying, all the same, arrows or will you have different lengths? Do you need a quiver that will help protect your arrows in all weather? What style will be the most comfortable for you to carry? Do you need a quiver that is ambidextrous or one that goes with your dominant hand? Is weight an issue? Who Needs a Bow Quiver ? Any hunter that is planning on using a bow can benefit from using a quiver. They make it quick, easy, and most importantly, quiet to get your next arrow ready to fire. Why Do You Need a Quiver for hunting? There are plenty of people out there that will argue with you about whether or not you need a quiver. Some will even go so far to say that using a quiver is going to muck up your balance, and make it harder for you to hit your target. The thing is, with modern bow designs, the quiver is not going to make too much of a difference in your balance, but it will help you to get to your next arrow in a quick fashion without having to struggle to grasp the next one when you really need it. Itis the type of quiver that you are thinking about when Robin Hood comes to mind. This type of quiver is usually just slung over your shoulder paying attention to which side you put it on to get easy access to arrows. a bow quiver is one that will be attached directly to your bow and is the type that a lot of naysayers do not like. This is typically used for compound bows. this is similar to the modern take of the back quiver. One big difference is that the traditional quivers often do not have tubes in them to keep your arrows from damaging each other. Overall, you cannot go wrong with any of these fine bow quivers. Each of them offers a lot of benefits from their highlighted features, and you should be able to identify which is the best quiver for your hunting needs. You will want to take into consideration where you want to wear the quiver, a number of arrows you want to carry, the type of arrowheads, and your dominate hand. Some standouts include the Tarantula brand due to their exceptional manufacturer warranty, the Hikingworld 21″ Waterproof Real Leather Archery Arrow Quiver for the interesting choice of materials, and the Bohning Adult Right Hand Target Quiver due to the versatility it offers.